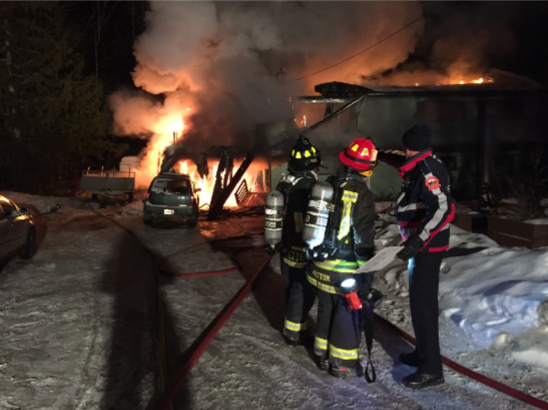 Nelson Fire and Rescue Services along with the Beasley and Blewett fire departments responded to a fire on Granite Road last week. It broke out just before midnight on Thursday, February 7 with 28 fire fighters in total attending the scene. Nelson Fire Chief Len McCharles explains the Water Tanker Shuttle Service had to be used. Portable pools are deployed where 1,500 to 2,000 gallons of water is dumped by tender trucks or water tankers as they’re also called. Then, the fire engine can pump the water into the hoses with the water tankers returning to a hydrant to refill. Chief McCharles describes the structure in the 2500 block of Granite Road as a two story dwelling, with the lower half of the building being spared from flames. The response is describes as a multi-jurisdictional team effort involving two fire engines, three tender trucks, two utility vehicles, a Nelson Hydro line truck and crew, RCMP and BC Ambulance. No injuries were reported from the fire and the cause is under investigation. The damage is estimated at $350,000.